The year decided to welcome itself with freezing temperatures all over the United States, INCLUDING here in Orlando, where it is currently in the high 30's! Brrrrrr!!! Hey, Elsa... the cold may not bother YOU, but it bothers US! Go back to Arendelle! Well, it's a new year, so let's talk about staying healthy at Disney. Seriously. Ok, ok... I know I blog a lot about high calorie, sugary, salty or deep fried concoctions that you can snack on in the parks. Disney is, after all, a magical world. A world full of fun, adventure, entertainment, and yes, FOOD. And even though the Cast Members make jokes about it, the calories DO, in fact, count on vacation. The good news is, Guests walk a LOT at Disney, and that should help combat some of those indulgent desserts and savory sauces. But if you're more of the healthy eating type, OR if you have some New Year's resolutions that you're trying to stick to, a trip to Disney doesn't have to send all your hard work up in smoke. Here are some ways to stay healthy, and still enjoy all that Disney has to offer! The first step to enjoying a healthy stay at Disney is to make sure you STAY that way! You won't be walking a whole lot, (or having much fun), if you are sick, sunburned, have blisters on your feet or are overheated. It's super important that you take preventive measures in order to stay in optimal condition on your trip. Once you have arrived on Disney property, don't let your guard down. Unfortunately, some Guests do visit the parks while ill, and you don't want to pick up what they are laying down. Carry hand sanitizer in your bag, and have your family use it frequently, especially after your kids have been playing in interactive queues or play areas. If you don't have sanitizer with you, there are always restrooms nearby for hand washing. And don't let our Florida sun slow you down! Be sure and stay hydrated, drinking water all throughout the day. Heat stroke is one of the most common ailments that effects Disney park Guests. Sit when you need a break, and stick with water and electrolyte drinks like Powerade, over soda or coffee. Oh, and even when the sun is hiding behind the clouds, and even if it's only 50 degrees, don't fool yourself into thinking that you don't need sunscreen! In Orlando, you are dealing with a much more intense sun than you may be used to back home. You should apply sunscreen every day, and bring it with you to reapply, multiple times per day. They do also sell sunscreen in the park, if needed. I realize your new sandals are super cute and that you got them specifically to go with your vacation outfit, but remember how much walking there is to do. Are you SURE you're still going to be loving those cute wedges when you walk the half mile from the bus drop off to the park entrance, and then the mile from the park entrance back to the France pavilion? Pack multiple pairs of well broken in, supportive, (yet still cute), shoes. Blisters are a real bummer to be dealing with in a theme park. Should a problem arise, and you find yourself sunburned, dehydrated, in pain, feeling sickly, or even just in need of a rest, there is a first aid center in each park, and there you can purchase necessities like over the counter medications, band-aids, sunscreen and more, as well as be treated for minor ailments and injuries. 2. Seek out (extra) activity. Disney is by no means a relaxing vacation. 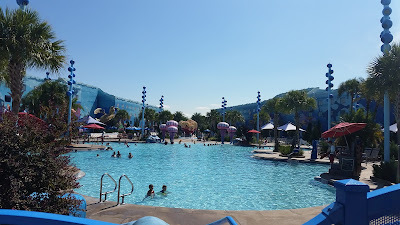 Unless you specifically have planned to avoid the parks and just hang by the pool, large amounts of walking are pretty much unavoidable. But maybe you want more than just park walking. No problem! There are a plethora of activities available to keep your heart rate up, right on Disney property! Runners will find jogging trails at many of the resorts. Just ask your Guest Services desk for a map and pick a route. Be sure and stick to marked routes, and do not plan on running outside of the resort's property, unless the jogging path is specifically designed to do so, like the one that links all three of the All Stars together. Most roadways around Disney property do not have sidewalks, and running in the street is very dangerous. But don't be shy about visiting other resorts just to run. 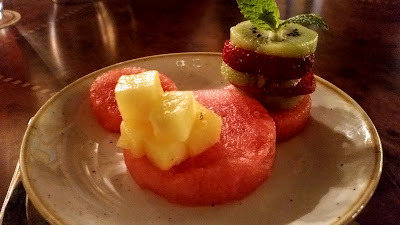 You're welcome to do so, and some of the best options are around the lagoon that connects the Epcot area resorts and running around the back woods of the Wilderness Lodge and Fort Wilderness. Biking, boating and running trails are available at Fort Wilderness. 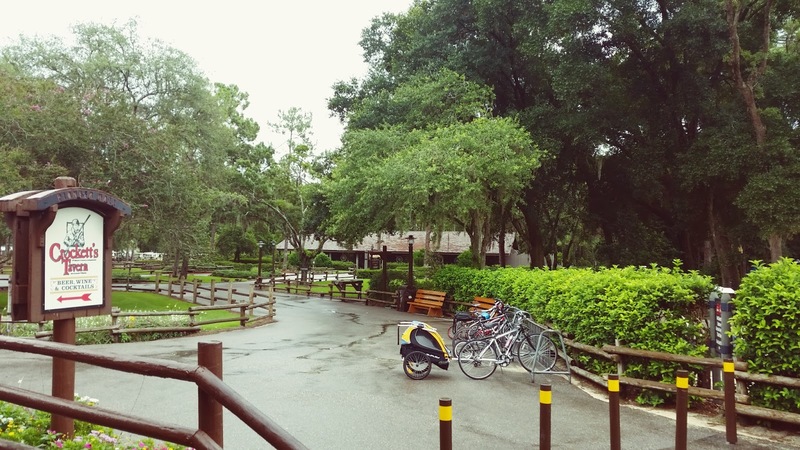 If running isn't really your thing, you can rent bikes at most of the Moderate and Deluxe Resorts, or even, canoes or kayaks at Fort Wilderness. Tennis, anyone? There are 7 resorts with clay courts available. If you want to shoot some hoops, you'll find 5 resorts with basketball courts. There are several golf courses, (and 2 mini-golf), horseback riding, water sports, sand volleyball courts... the list goes on. 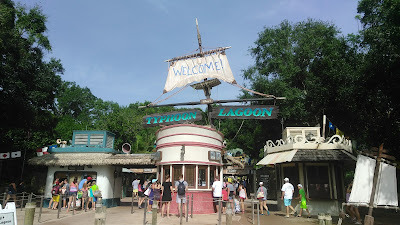 You can even take surf lessons in Typhoon Lagoon's wave pool by pre-reserving a space! Hang ten, and get fit, at Typhoon Lagoon! And let's not forget, every resort has a minimum of one pool, but most have many. Plus the Deluxe Resorts, (and Coronado Springs), boast beautiful, state of the art fitness centers. With all of these options at your fingertips, you'll have no problem working off that dessert that you HAD to eat because it was included in your Dining Plan! A swim in your resort's pool will surely burn some calories! 3. Disney Chefs got you covered! 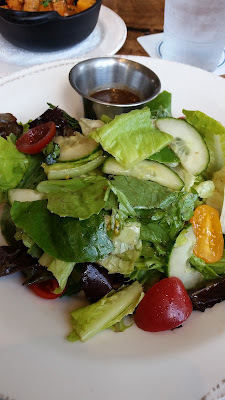 When eating in Disney's full service restaurants, don't be shy about speaking up regarding dieting needs and preferences. If you are in need of a specific diet, i.e. 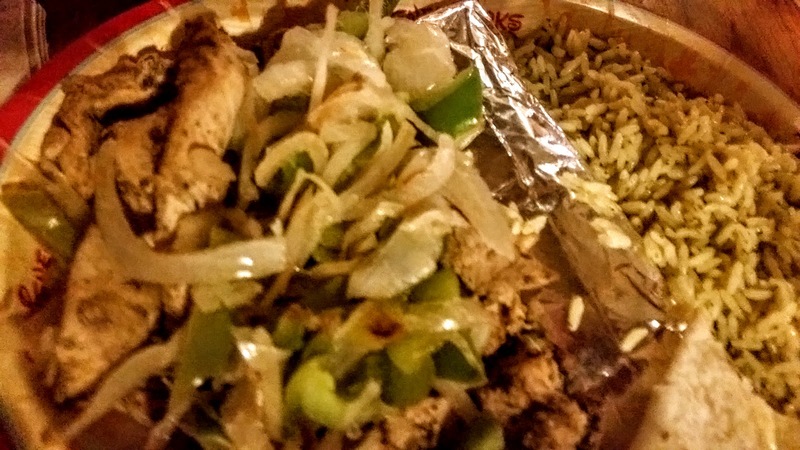 gluten free, sugar free, low fat, etc., mention it to your server. 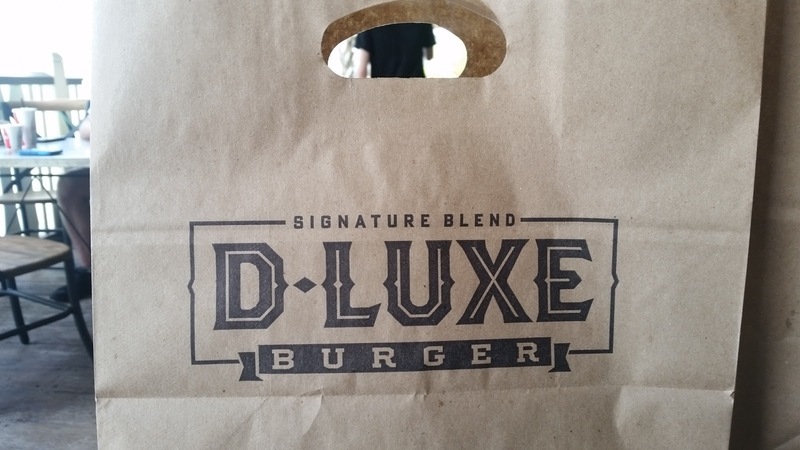 They will help steer you toward the best options for you on the menu. Do you really want the beef tenderloin, but that herb butter is just too much fat for you? Chefs can frequently make reasonable alterations to menu items for you, at your request. Even if there is nothing on the menu that seems like it's going to suit your needs, voice your concerns to your server. 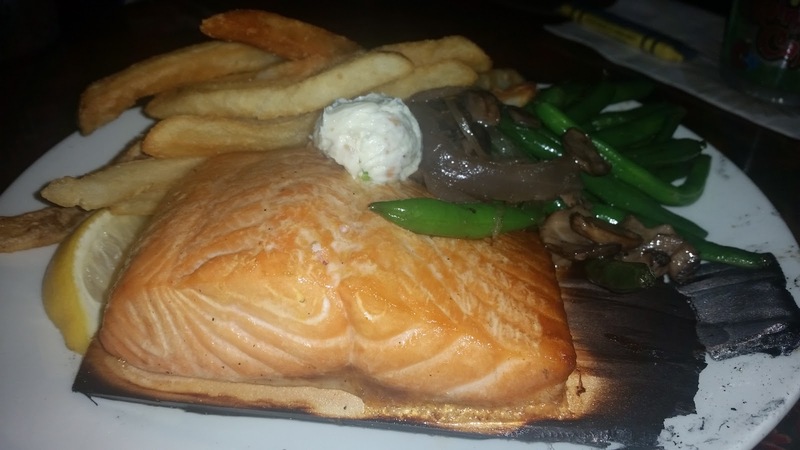 Sometimes Chefs will go ahead and make you a plain piece of fish or chicken, with a side of veggies, even if it's not on the regular menu. 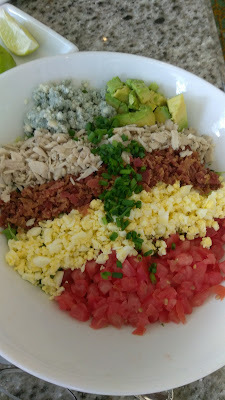 Salads abound at Disney full service restaurants! 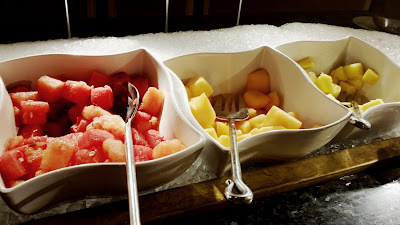 Breakfast buffets always have a plentiful array of fruit. Now, a couple of words of advice to go along with all of this. Firstly, whenever possible, check out menus in advance, before making dining reservations, (you can find all of them, HERE). That way, you can get an idea of how well a restaurant can accommodate your dieting needs with their regular menu. Whenever possible, notate your dieting needs on your reservation in advance. (The agents at Kingdom Konsultants can do this for you.) Also, keep in mind that Chefs are more likely to be able to help you in an a la carte restaurant than at a buffet or an all-you-care-to-eat style, though it's worth asking for assistance at both. (Most buffets will have several lighter fare options.) And lastly, make sure you keep in mind that the Chefs will try their best, but may not always be able to make just what you need, the way you need it. The busier the restaurant is, the harder it is for them to help. Be mindful of their time, and appreciative of their assistance. 4. Know your counter service options. When you think 'theme park fast food' you probably think greasy burgers, fries, hot dogs and fattening desserts and though you'll have no problem finding those things if you want them, Disney quick service restaurants have SO much more to offer! No matter which counter service location you choose to eat at, you'll almost always find better-for-you options like grilled chicken salad, or a lighter sandwich or wrap, but if you know in advance where to find the good stuff, all the better. Some, restaurants, like D-Luxe Burger, can sub out your bun for lettuce! 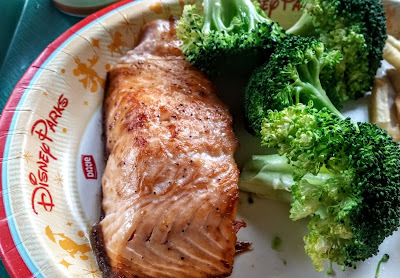 Grilled salmon and steamed broccoli from ABC Cafe! For example, in The Magic Kingdom, did you know that the revamped menu at Pecos Bill's offers Mexican style rice bowls and fajitas? Or that Seasons in Epcot has delicious baked salmon? In fact, Epcot's World Showcase has some of the most unique, healthier options like chicken kabobs from Tangerine Cafe in Morocco, or fresh sushi from Kabuki Cafe in Japan. 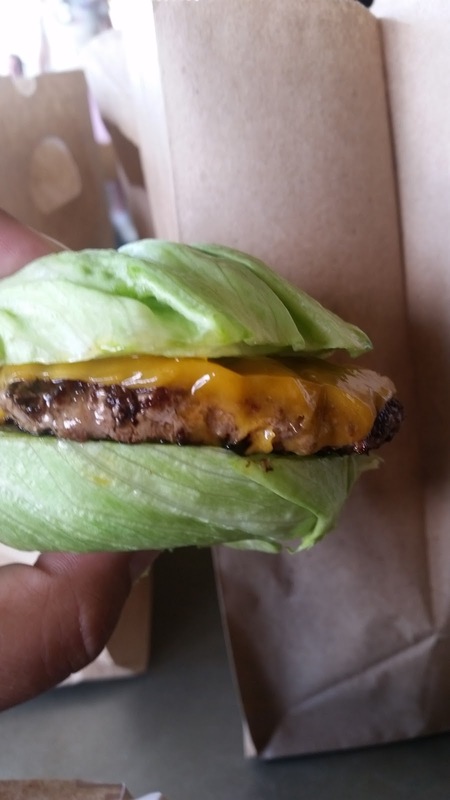 The point is that you don't have to settle for fatty, unsatisfying foods just because you're eating at counter service restaurants. There are plenty of baked, grilled and roasted meats, fresh veggies and salads, and even meatless options all around. You just need to know where to look. You can pick out some good options using your park map, or even better, by checking out the various locations' menus on the My Disney Experience smart phone app! 5. Snack like you mean it! As far as the Disney food experience goes, to me, snacking is an important part. Disney is really, really good at snacks. Yes, there's a lot of cupcakes, churros, fudge and ice cream, but there are also tasty options that won't eat up your entire calorie intake for the day. Each park has at least one fresh fruit cart, which sells whole fruit like apples, bananas and oranges, as well as seasonal sliced fruits, including melon, pineapple and more! They also typically carry lighter snacks like trail mix, granola bars, nuts, and pickles. 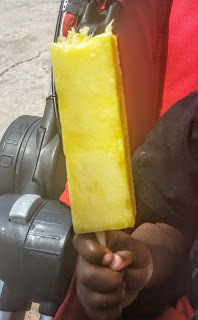 Almost all counter service restaurants carry apple slices, apple sauce, yogurt, baby carrots and/or grapes as substitute sides, or they can be purchased a la carte. 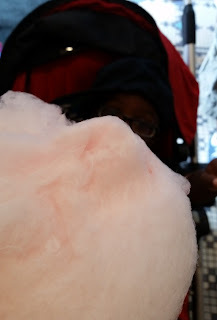 Oh, and his other favorite... cotton candy! If you're wanting to indulge in something distinctly Disney, without overdoing it, there are ways to do that too. In most candy shops, like The Main Street Confectionery in The Magic Kingdom, and Zuri's Sweets in Animal Kingdom, there are options other than giant cookies that will do less damage, but taste just as good, like chocolate covered pineapple on a stick, plain caramel or candy apples, or even cotton candy, (which may be straight up sugar, but one serving is only about 100 calories). The world famous "Dole Whip" pineapple soft serve only runs about 90 calories a serving and is SO delicious! Most ice cream shops carry frozen yogurt or lowfat options, and you can even get frozen strawberry bars or frozen chocolate covered bananas from outdoor carts. Options like shaved ice or slushes are relatively good choices too, since though they are high in sugar, they are fat free. There are lots of "smarter for you" choices, so you don't ever need to feel like you're missing out! And here's a BONUS TIP for you: If you do overindulge, don't beat yourself up. You ARE on vacation and it's not every day you get to have a Darth Vader peanut butter chocolate cupcake, or a cinnamon and sugar fried donut/croissant hybrid. Whatever you indulge in, enjoy it. With all the planning and executing you did to make this trip happen, you deserve it. Just do an extra lap around World Showcase, and you'll be just fine!